It is already a week since my last night of flamenco in Jerez, but the rhythms are still going round in my head. I recall rippling guitar melodies and the brightly lit stage pictures of dancers when I am undertaking the most mundane of household tasks at home in south London (though it’s difficult to tap out a rhythm on the kitchen floor when wearing carpet slippers, I’ve found). I saw some excellent exponents of flamenco singing too, not just musicians and dancers. Most, if not all, of them were women. At Sala Paul there was the Sevillana singer, Esperanza Fernandez, ( pictured left ) interpreting and enlivening some of the older flamenco styles in her own fashion. With a young dancer, Ana Morales, she entranced and engaged the audience, her super-life-size personality reaching across from the stage into the auditorium. At the Palacio, on the same night as Eva Rubichi, there was Tamara Tane, she of what the local reviewer described as ‘the volcanic voice’. 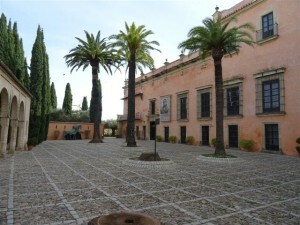 The Palacio Villavicencio is probably my favourite venue (see picture of its courtyard, right). An 18th century palace inside the Alcazar, which itself dates back to the twelfth century, the concerts take place in a first floor salon. Its recessed windows overlook the arab-style gardens and its wooden floor and arched ceiling provide the perfect acoustics for the more intimate musical experiences. It was here that I first became acquainted with the guitar music of Antonio Rey, my very first flamenco recital and one which I still haven’t forgotten. At one end of the salon a large portrait, of Elizabeth II of Spain, gazes down, looking like a young Victoria with her severe, centrally parted hair and tiny waist. The salon is lit by heavy glass chandeliers. Mindful of this blog, I duly took several photographs of this elegant interior, only to leave my camera in Spain (and prompting much gnashing of teeth when I realised what I’d done). I will post the photographs on Pinterest when it is retrieved. In the meanwhile, many thanks to my companions who have generously supplied replacements. But back to the flamenco. In the Sala Compania, I saw the excellent dancers Claudia Cruz and Marina Valiente, from Cadiz and Seville respectively, presenting the different styles and dances from their particular cities. The choreography for the alegrias was credited to one Manuel Linan (remember that name). The picture which stayed with me was of both dancers, dressed, identically, in white, dancing in perfect unison at the end of their set. One of the most memorable concerts, however, was less traditional. David Carpio and his collaborators, Manuel Valencia (guitar) and Pablo Martin Caminero (double bass) had been working on their set for two years (since Carpio’s appearance at Jerez in 2013). The doublebass is not usually associated with flamenco, but here it fitted perfectly, occasionally giving a jazzy feel with plucked rhythms, but also blending beautifully, when bowed, with the guitar, which was played in masterly fashion by Valencia. Over and through the music Carpio threaded his strong and sinuous voice, most stunningly in an a capella duet with the remarkable young dancer, Manuel Linan, lately of Spain’s National Ballet. Playing the older man of experience, Carpio counselled the younger man, played by Linan, who replied in dance. This would have brought the house down, were the audience not so eager for more music. So the standing ovation was reserved for the end of the performance. I reserve a final word for Linan. He first appeared backlit on stage and in dramatic profile, his hair half drawn back into a topknot and wearing a flounced flamenco skirt, which made the audience think again about what they had read in their programme. Wasn’t the dancer a man? Well, yes he most certainly was, but he used the trailing skirt, worn over trousers, as a prop, and a link to the flamenco tradition. It was discarded after the first number, though it reappeared later, as did a suit jacket and a waistcoat. His dancing was astonishing, rapping out the rhythms with feet and hands in flamenco manner, but displaying the strength, grace and balance of a ballet dancer as he leapt and spun. You can see clips from Linan’s other performances below. His level of artistry, like that of his collaborators, was supremely high and they were doing what they wanted with their art, taking the traditional to a new place. So, it’s back to south London for me, at least for a while. But life is exciting – I will be launching my first collection of short stories on to the world in April. Nonetheless, I am already looking forward to Festival 2016, when I, and the friends who love flamenco, will do it all again!